Hello! Are you bored to stare at the same layout every day? Want a better user experience? I'll help you out. You can also drag the entire chat around on your screen which Jacob_ approves was a neat touch. Jacob_ doesn't like round layouts which is why I don't think we'll ever see this chat as the original one, but for those who want it or want site related bugs like the 'Edit Full Post' bug fixed, feel free to let me know. How do I apply this layout to my OS page? You need a Chrome Extension called "TamperMonkey". 4) Go back to OnlineSequencer.net and refresh the page. Open up Tampermonkey just like in step 2 and activate "Chat Layout". Now refresh the page once more and it should work. You might want to experiment to reposition the #chatplaceholder's top and left pixel positions if the chat seems to go off screen when you open it and if you should run into any other issues with this, let me know. Just make a new userscript and copy paste it in, remember to save it, activate it, and refresh the page. Feel free to improve the chat bot in any way you want. //This is VoidZee's rusty chatbot. Not the prettiest and best code but it does the job. //Feel free to improve this and add your own commands if you know how to code. // Codes below are unimportant. //Interval loops every half second, you can make the bot react faster if you lower the number to like 100 but I wouldn't recommend it since it slows down your PC. //Enjoy the dark OS theme! Made by VoidZee. Cool. Sticking thread for anyone that wants it. Added my chat bot to the list for usage. Feel free to improve it in any way you want. Enjoy. // Send a message to chat. if(!messageInput) return; // if the user has not openend the chat yet, return. // Execute `fn` every time a new message has been recieved. // check whether the user has even opened the chat yet. // cleared, and so `latest` will no longer be a part of #chat_table. "What do you call it when a white man dancing has a seizure? An improvement." I created a tamper monkey script to make our lives a little easier. I think we can combine our powers and make some really cool stuff. I did my best alright, that's what matters. I'm lazy on the coding part but enjoy having no chat. quick Edit: I found out about this method in Tampermonkey called "@run-at document-start" which means it will run this code before the site starts so the effects of this is instant, I should've done this to all my previous codes because I quit using tampermonkey due to not being able to load my 'cool' effects instantly after always F5'ing the page or going to the site. 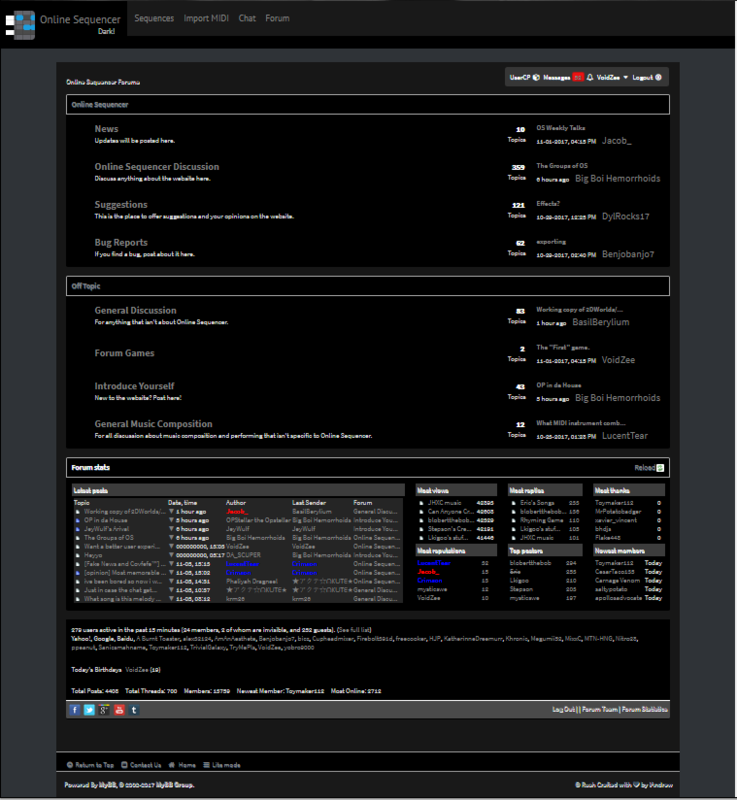 Dark Theme, now with Forum. Check the thread for sourcecode. Added 'Dark Theme' due to being requested by ParaSpider. EDIT: Version 2 Released. Hope you enjoy it but let me know if you want to change something in it because I know it isn't the prettiest. If you press save, it'll saves the song so don't worry. I simply removed the notification button. 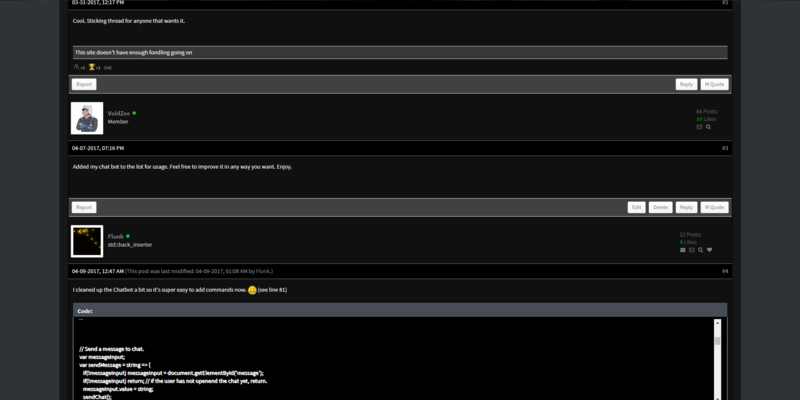 EDIT: I was able to make the Forums thanks to Jacob showing me what "!important" does to elements in CSS. Lucent has given me the permission to do whatever I want with the chat, excluding colour and size changes. I may release a chat-bot of my own soon, but I make no guarantees. I will use my own code, but I looked over your code a bit so I don't re-invent the wheel too much. Overall, I already invented my own methods for doing this, but I will adopt a 500 ms delay. EDIT: Also in chat, the Mobile friendly and move to sidebar kinda over laps the top left of the chat a bit. OK, I actually easily fixed the things I felt needed to be fixed. Here it is if anyone else wants to use it.